Last year, we raised $35,000 for the Micheal J Fox Foundation to support research efforts that will lead to a cure for PD. Our first tournament had 144 golfers, 90 dinner guests, 30+ volunteers and more than 50 silent auction items. Our grand prize for the evening was a 7-day trip to Ireland for two. In 2019 Team Kopacz has already contributed $3,000 to the Michael J Fox Foundation. We kicked off the year running the Disney Half Marathon with Team Fox. We are working on a new project for 2019 that will incorporate running and the benefits of a exercise on slowing the progression of PD. We are calling it the 500 Mile PD Challenge! 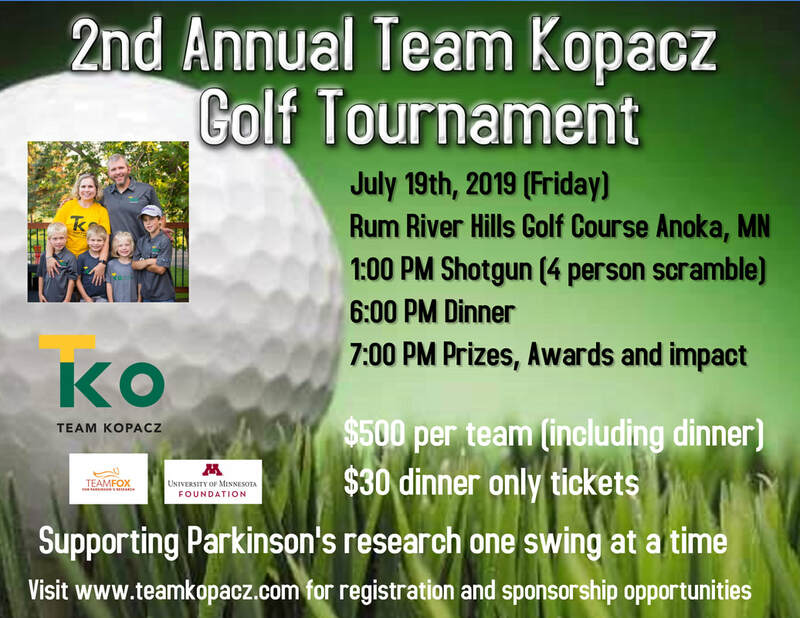 We are excited to kick off the 2nd Annual Team Kopacz Tournament, details below. Click on the flyer below to go straight to the registration page or you can find more information on the 2019 Golf Tournament page. Donate Directly to the Michael J Fox Foundation.